Lamenting the passing of the print edition of New Musical Express in a post on Just Backdated about a year ago, I dwelt on how this represented the final nail in the coffin of the UK’s once vibrant weekly music press, of which I was once a part. Its downfall was calamitous – in the early seventies over half a million music papers were bought across five separate titles every week, whereas by the time NME, the last one standing, became a freebie in 2015 it was selling just over 15,000 a week, so that’s a 97% fall. What I failed to stress was that apart from the sheer numbers that had now dwindled to zero, NME’s passing signalled the ultimate demise of a culture wherein gifted young writers had a big audience for whom they had free rein to write pretty much what they liked so long as it was tangentially connected to popular music or of interest to those who followed it. 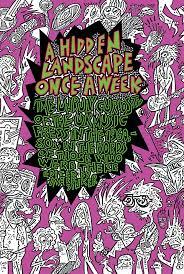 This omission on my part has been rectified by a 392-page book with the unwieldy title of A Hidden Landscape Once A Week: The Unruly Curiosity of the UK Music Press from the 1960s to the ‘80s by Those Who Were There, an anthology of essays and transcribed conversations edited by Mark Sinker. Its origins lie in a conference on the subject that he organised in 2015 at Birkbeck University, and contributors include Valerie Wilmer, Charles Shaar Murray, Richard Williams, Penny Reel, Jonh Ingham, Jon Savage, Cynthia Rose, Paul Morley, David Toop, Bob Stanley, Barney Hoskyns, Jonathon Green, Simon Frith, Paul Gilroy and many others. Published by Strange Attractor Press through a crowd funding initiative to which I contributed, the book’s focus is not so much on the music we all wrote about as on the ways in which the writers on the music press were was able to influence young minds. It was a slightly subversive, left-leaning and largely uncensored culture, an unrestricted pathway into the underground, and although on Melody Maker we tended to shy away from politics and radical ideas, NME dived right in, snatching the initiative by hiring writers whose views were fairly radical, who weren’t afraid to dismantle sacred cows and who were never less than entertaining to read. Management didn’t interfere because the papers were making pots of money, and the straight world was looking the other way. It was the same at Sounds, published between 1970 and 1991. Like NME they were a bit more extreme than MM in their tastes, but neither offered the comprehensive music coverage of MM which as well as rock and pop had pages devoted to jazz, folk and blues and, whether its readers wanted it or not, followed an unspoken rule that when an artist reached the charts for the first time we did a feature on them regardless of the kind of music they performed, even Clive Dunn and ‘Grandad’. The ebb and flow of the fortunes of the papers is a running theme of Hidden Landscapes, at least until NME’s circulation overtook that of MM around 1974. Until 1972 NME lacked identity and, hard though it is to believe now, even faced closure. Its fortunes were revived by far-sighted editor Nick Logan who recruited writers like Murray, Nick Kent and Ian MacDonald and rapidly turned things around with an approach that leaned towards the ‘new journalism’ style from America, the work of writers like Tom Wolfe, Hunter Thompson and Terry Southern who often became part of the story they were writing. This wasn’t MM’s style. The truth is that, like Billy Bragg, we didn’t want to change the world. I just wanted to write about rock’n’roll and felt truly blessed to be able to do so for a living. And we worked pretty damned hard too. Although to the outsider it must have seemed like a dream job – getting paid to meet rock stars and go to gigs for free – we churned out feature after feature, interview after interview, review after review, every week of the year. Concerts took place at night so we worked nights and weekends. We had deadlines to hit. When I was MM’s news editor I was at my desk by eight on Monday mornings and was still at it 10 hours later, desperately scrabbling together music news stories to fill the first four or five pages of the paper. This view of the music press doesn’t have much time for the present day glossy monthlies whose coverage of rock and pop is largely benign and often nostalgic, and which values facts and reminiscences over opinions and campaigning. That they prospered while the weeklies declined is a source of some frustration for many of those who contribute to Hidden Landscapes..., though Bob Stanley’s appraisal of Smash Hits is an even-handed account of the brightest pop magazine ever. In the chapter called ‘The Engine Room’, writers talk about tradecraft and pressure from management to go easy when reviewing records released by labels that were big advertisers, demands that were invariably ignored. A bit of this sort of thing happened on MM and I well remember Island boss Chris Blackwell threatening to withdraw the label’s advertising in 1974 after I gave Traffic, a band I loved, a bad review after a sloppy show in New York. It didn’t happen. The thing was, unlike today, the weeklies exerted a powerful influence over taste: the record labels needed us more than we needed them, so after a bit of grumbling they always came back. At the first Louder Than Words Festival in 2014 I listened to a discussion, chaired by the then editor of NME, in which those on the panel, all writers much younger than myself, sought to dismantle ideas about the (supposed) ‘Golden Age of the Music Press’. They seemed to be promoting the concept that it was just as good now – in 2014 – as it was in the 1970s. I didn’t join in from the floor. I figured that if I did I’d sound like one of those TV sports commentators who begin sentences with ‘in my day’, and bang on about how much better it was then. Well, although it’s probably of interest only to those who remember the days when the combined circulation of the weekly music press really did exceed half a million, Hidden Landscapes… presents a watertight argument that it was.